Description: Tiruvanchiyam is located 10 km west of Nannilam (railway station) and 18 km northwest of Tiruvarur. Kondeeswaram is located at about 7 km east of Tiruvanchiyam. This Shivastalam is a vast temple and a muktistalam where the Ganges is said to have bathed in the Gupta Ganga theertham to rid herself of the blemishes of those bathing in the Ganges. It is considered to be the 70th in the series of Tevara Stalams in the Chola kingdom located south of the river Kaveri. Legends: Mahalakshmi is said to have prayed to Shiva and united with Mahavishnu here.. Yama is said to have worshipped Shiva here Bhrama, Parasarar, Atri have worshipped at this shrine said to be on par with Benares. 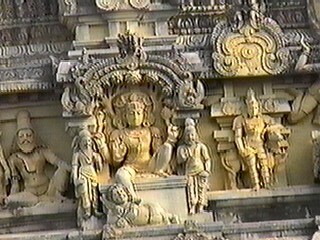 The sandal stalavriksham imparts the name Chandanaranyam to the shrine. Mahalakshmi's 'Vaanchai' for Vishnu, and the fact that her prayers were answered here imparted the name Tiruvanchiyam. Legend has it that Bhrahma, Indra and Paraasarara worshipped Shiva here. This temple with 3 prakarams and several gopurams and vimanams occupies an area of about 3 acres and the large Gupta Ganga tank is located adjacent to it. This temple covers an area of about 3.5 acres . The original stone structure of the temple dates back to the period of Kulottonga Chola I (1075-1120). Renovation of the entire temple and the building of the shrine to Mangalanayaki took place during the rule of Rajaraja Chola II (1146-1172 CE). A dip in the temple tank on Sundays in the month of Scorpio is considered sacred here. There are 2 separate shrines to Dakshinamurthy here. There is a shrine to Yama, and Shiva is taken in procession on the Yama mount on the Bharani asterism in the month of Maasi. This shrine is considered to be on par with Benares along with 5 other shrines along the course of the river Kaveri, the five being Tiruvidaimarudur, Tiruvenkaadu, Mayilaaduturai, Tiruvaiyaru and Vedaranyam. Shivalingams corresponding to these shrines - Mahalingeswarar, Aghoreswarar, Mayuranathar, Panchanadeeswarar and Vedaranyeswarar are located in this shrine. All three of the Tevaram saints have sung praises of this shrine. Appar is said to have visited this temple with Sambandar. Manikkavacakar also sings of the miracle of a Naga kannika (Snake princess) who worshipped Shiva and became one with Him as Ammai Appan. Festivals: Six worship services are offered each day. The annual Bhrammotsavam is celebrated in the month of Kartikai. Aadi Pooram, Navaratri and Sundays in the month of Kartikai are also considered special.